WELCOME! It's the month long Networking Blog Hop With our fourth CLIMB GIVEAWAY! 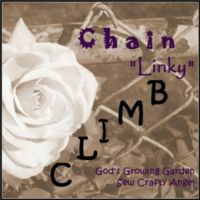 Here's how it works - the co-hosts from the previous month's CLIMB will have the opportunity to participate in a Giveaway during the next CLIMB - that gives co-hosts 2 months in a row of blog growing fun!! Cathy is our permanent week#3 co-host. Chris from "A Kitchen Hoor"
Chris is a fantastic cook and this is how she describes that love. "My kitchen is my zen place. It's rarely a place where stress goes, unless I'm trying to make bernaise from scratch. Yeah...didn't happen. *sigh* I love to mutate recipes into my own creations. I am thrilled when my baking comes out yummy! I only wish I had the technical knowledge to be able to really create baked goods from my own brain instead of some mutant version of one I've tried." Renee's blog started out as a weight loss blog but she changed direction a little and now has created an awesome blog of anything and everything to go along with her weight loss journey. Go check it out. - 1 Month Ad Space on God's Growing Garden - a beautiful handmade "Coffee Cozy" by Kaitlyn from Three Sisters & Us THERE ARE MANY WAYS TO ENTER! Wow, so impressed with all that went into to putting all this together! , what a fantastic idea!!!! !